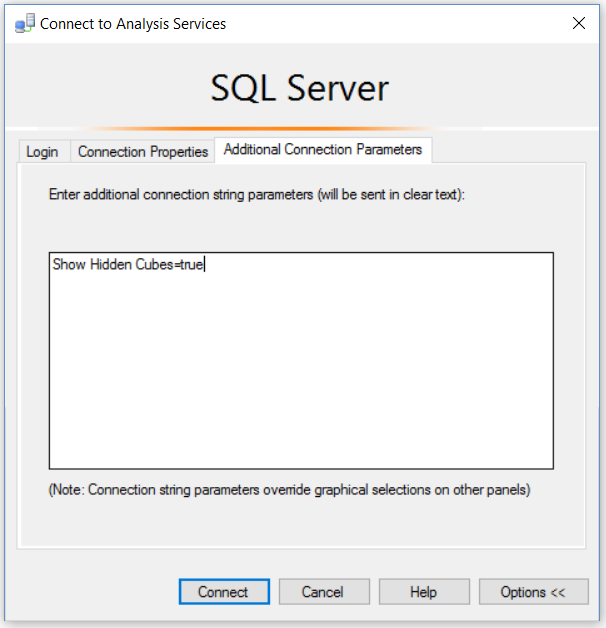 Connection string properties can be set in the Additional Connection Parameters tab of the connection dialog that appears when you open a new MDX query window. Unfortunately this doesn’t make any objects in the cube that are not visible, like measures or dimensions, visible again – it just makes the cube itself visible. However, if you’re working on the Calculations tab of the Cube Editor in SSDT it is possible to make all hidden objects visible as I show here. I was wondering in what scenarios would you hide a cube? I’ve never seen it so keen to understand when it occurs what scenarios its used in. Good question! Sometimes I think people hide a large cube and only make the perspectives visible.